Remember Munchos? I know they’re still around, but since most mainstream companies have ditched trans fats, I wonder if they’re still the greasy, salty, potato conglomerates of generations past. I loved them. Back in high school, kids lined up outside 7-11 after school. I wasn’t one of the cool kids sitting on the curb drinking a 40 from a paper bag. I was the nerdy, chubby kid grabbing a bag of Munchos and rushing home to study Calculus. I don’t care what anyone says, those chips were glorious. They aren’t even totally a potato chip. Frito Lay stretches the potato with corn. If you want to see a few examples of what corn has done to our lives, check out the movie King Corn. It’s rather enlightening. 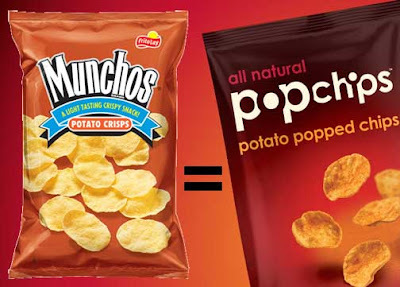 I recently stumbled onto Pop Chips. My cafeteria at work sells them and I thought I’d take a chance. Low and behold, Pop Chips are the all-natural reincarnation of Munchos! Hooray! They’re “popped” with air rather than baked or fried. They do use a little rice flour as a binder, but for the most part, they’re a crispy, salty potato chip. They taste exactly like the Munchos I remember, but with fewer calories and more than half the fat missing from the equation. It’s Monday. Go wild. Grab yourself a bag and enjoy. Just picked up a small bag at Smoothie King since the nutrition label looked okay. Decided they tasted exactly like Munchos -- googled for similar thoughts -- voila, here I am.